A fresh floral corsage accents a formal outfit during memorable occasions such as a prom, wedding or other notable event. 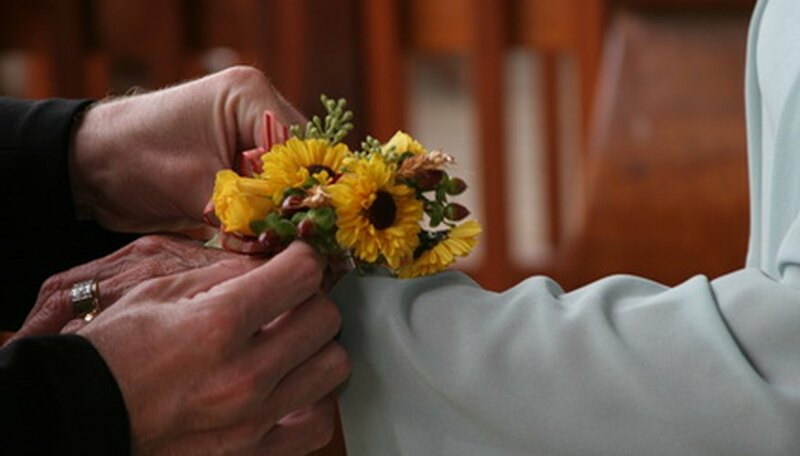 Keeping your corsage allows you to hold onto the memories you cherish indefinitely when you know how to preserve it. Knowing how to preserve your fresh floral corsage makes it possible for you to keep it forever, or at least for many years to come. Measure the dimensions of the corsage and obtain a clear acrylic keepsake box from a craft or hobby shop that is large enough to hold it. Hold a can of hairspray about 5 inches from the surface of the corsage blossoms and press firmly on the nozzle to release a fine mist. Spray every bit of flora and foliage using the hairspray. This locks in color and keeps the petals and leaves from falling from the stems. Use a can of aerosol hairspray as opposed to the kind that pump out of a plastic bottle. Place the corsage carefully into the acrylic keepsake box. Do not let the hairspray-covered flowers touch the inside of the acrylic walls. This smudges them and makes it hard to see the flowers. Cover the acrylic box with its airtight lid. From here, it will take approximately three months for the flower to completely dry out because of the lack of air inside of the box. The corsage will not lose any color because of the hairspray.